Happy to announce that I've been selected to participate in the StartUp Art Fair in Los Angeles in early 2018. I'll be in Suite 318 at The Kinney Hotel in Venice Beach along with 40 other amazing artists! Get all the details on my event page. Hearts in SF benefits the SF General Hospital Foundation. My heart along with others created recently by Bay Area artists will be revealed at an event at AT&T Park in February of 2018. It was an honor to have been selected twice to create one of these iconic hearts, and I'm so thrilled with how it turned out. I also recently learned that my heart has been featured on the cover of the February issue of WHERE Magazine! View a short video of my SF Heart being wrapped for pick up from my studio. My participation in SF Open Studios is just around the corner. I invite you to visit my dedicated SFOS Page to learn more. Thank you! I can finally share the BIG news! 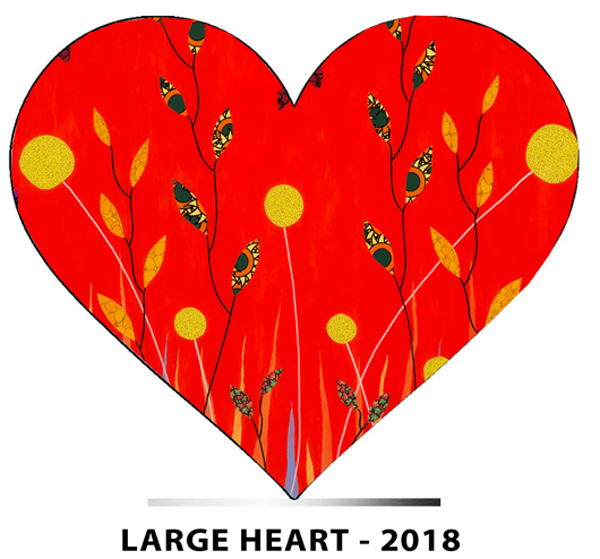 I have been selected for a second time to create a Large San Francisco Heart for SF General Hospital Foundation's Heroes and Hearts! I will be working on the heart over the next two months and will be sharing my progress. The Heroes and Hearts ceremony will be held at AT&T Park in February of 2018. I am truly honored to have been asked again to create one of these iconic SF Hearts. Below is the design I submitted for consideration, which is inspired by my original mixed media and resin work. Stay tuned for regular updates. I also invite you to follow me on Facebook and Instagram! For those of you that visited my booth during this year's fair and have questions about a piece of artwork or possible commission please feel free to contact me directly at 415.717.9209 or via email at john-at-johnkraft.com. Thank you! I'm excited to announce that I have been accepted as a member of the Red Umbrellas Fine Artists group! You'll find me and my original mixed media and resin artwork in places like Union Square and Golden Gate Park. The photo above is from a recent exhibit outside the de Young Museum in Golden Gate Park. Check my events page for upcoming dates and locations. For most people, the phrase fun in the sun brings to mind beaches, cabanas, poolside margaritas or crashing waves... But for me, it can also mean a long day in jeans and a black shirt, under a white tent, talking to people about my art; all while strong winds threaten to carry me (and my art) far far away. This past weekend I had the pleasure of participating as a guest artist outside Norton Factory Studios in Oakland - and... I had a blast! I met many new people and saw quite a few old friends as well. In my defense, I do believe that stealing chalk for the purpose of creating a bit of street art is a pretty good excuse - but still, my girls were quick to remind me that I need to replenish their supply... Fair enough. It was a fun way to extend my Flower Power collection from the art on the wall to the ground beneath my feet. The sun, wind and stolen chalk combined and resulted in a happy collector deciding to go home with my piece, Aquarius. The image above is what it's all about for me as an artist. I care so deeply about creating joyful and accessible art that when someone new decides to make my art a part of their life - it could be raining beneath a full solar eclipse - and I'd still feel like the luckiest guy in town. I am very happy to share my latest piece, Wild Honey! The newest addition to my Flower Power series is also the largest, measuring 48 inches by 72 inches. It is also distinguished from the other works in the series because I've finished it with multiple coats of varnish vs. epoxy resin. More detail can be seen in the photographs below. This is a big piece that makes a big statement, wether it be in a home or in a corporate setting. So if you're ready to GO BIG - this is the perfect opportunity! Learn More... More photos below! Now you might be saying, gee whiz, that sounds like a plug for Art Resin. Well, I'm happy to say - yes, that's exactly right. I hesitated working with resin for YEARS for a number of reasons... The first was concerns about it being toxic... But Art Resin is zero VOC and doesn't have the nasty odor associated with other resins. I was also a bit overwhelmed about the idea of learning how to use it, but the Art Resin website and YouTube channel have tons of examples and how-to info. The last reason I tend to support and advocate for these folks is the company is owned and run by some genuinely cool and down to earth people - David and Rebecca. You'll see them in many of the videos. They are authentic, fun and really just want to help people create cool art. The fact that they are a young family making a living doing what they love is a big added bonus in my book. So, with all that said, I encourage any artists that are on the fence to give Art Resin a try. Start with something small and work your way up. Go for it!